Is a low cost enough to save email marketing as a lead gen tool? 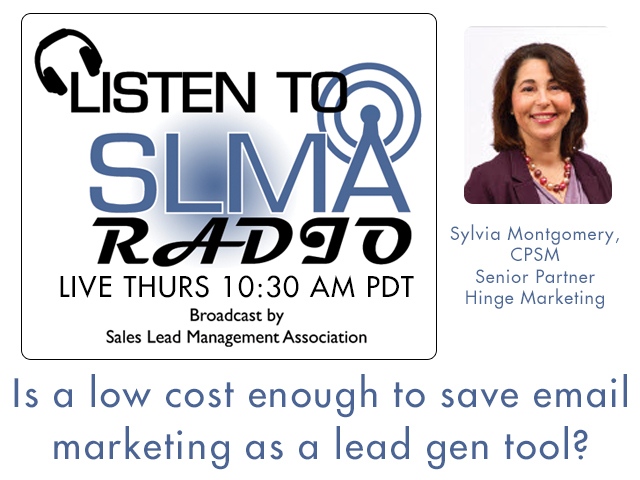 Sylvia Montgomery, Partner at Hinge Marketing tackles a tough question about the efficiency of email marketing to generate leads. Email response rates continue to be an issue and many companies clinging to it because of cost. Certainly garbage in and poor response out isn’t unusual. A major database supplier said to me, “Well, Jim, don’t blame the database, blame the offer, blame the subject line, blame the product, but don’t blame the database or the method of getting it to the reader. We’ll see what Sylvia has to say. A Senior Partner and the head of Hinge’s A/E/C practice, Sylvia collects many shoes and wears many hats. When she’s not traveling around the country for speaking engagements or client meetings, you will find Sylvia creating marketing and branding strategies for clients, supervising her A/E/C team, developing new business, or working on her personal brand. With a 20-year career spanning visual communications, strategy, and marketing, and over a decade working in the A/E/C sector, Sylvia brings a creative, business-focused approach to her client engagements. She specializes in agile marketing for professional services firms, creating actionable, research-driven strategies tailored to helping businesses grow. A Starbucks aficionado, Sylvia credits her success to a top-secret formula involving caffeine and yoga. Sylvia came to Hinge from Bowman Consulting, one of the fastest-growing engineering firms in the Mid-Atlantic, where she was Director of Marketing. Prior to that, she held executive-level marketing positions at Rubbermaid Commercial Products, a major consumer brand, and Digital Commerce, a technology firm. Sylvia is an active member of the Society for Marketing Professional Services (SMPS), where she held a seat on the board of directors, and she frequently speaks and writes on topics related to the A/E/C industry and marketing. Previously, Sylvia has served as adjunct professor at both Trinity College and George Washington University. Sylvia holds an MBA from the University of Maryland, University College, an MFA from George Washington University, and a BA from Trinity University. Because we've worked with a lot of firms in your industry, we have a pretty good idea already what challenges you face. We've also done the due diligence to know what strategies have worked for the leaders in your market. Talk to us — we'll show you the way. The marketplace is always changing. That's why we conduct regular research into issues that affect our clients. This research gives us the insights we need to advise our professional services clients and adapt to evolving conditions. The time and effort we put into original research is painful, but it gives us — and our clients — a true competitive advantage. The best firms can't afford to look bad. It's tough to maintain a great reputation if your image isn't up to the task. At Hinge, we've invested in an award-winning creative team that makes our clients look great and speak with confidence.